Hiring? Toptal handpicks top financial forecasting finance experts to suit your needs. Net burn rate is calculated as the net cash spend per month; that is, the net of cash inflows and cash outflows that occur when running your business. Gross burn rate corresponds solely to the cash outflows per month. A burn rate is particularly important for seeing the runway available for the business, which is the time left to survive based on current funding resources. In months, a runway is simply cash reserves divided by current monthly burn. Building Product Stage: Up to $50,000 gross burn. Building Usage Stage: Up to $100,000 gross burn. Building the Business Stage: Up to $250,000 gross burn. How do I control my burn rate? Don't get carried away and remain focused on your current stage of growth and development targets. Trying to do everything all at once will result in high burn and reduced runway. Be aware of your market dynamics and sales cycles. For example, if you're an enterprise-focused business, winning customers may take longer than expected and result in delayed cash flows. Hire properly and find the right mix between roles. Avoid an expensive but potentially inappropriate big ticket hire and ensure that team members put on multiple hats to avoid unnecessary hires that are underutilized. Operating cash flows: Favor contract staff over hiring directly—this will provide flexibility to cut costs, or increase production with immediate effect, if required. Investing cash flows: Rent, or lease, anything that you can get your hands on. Capex generally is an unnecessary luxury for young companies. Financing cash flows: If your business is financed through loan or bonds that produce significant interest expenses, be aware of their effect and, if directly related to your operations, ensure that they are included within your burn. Is a high burn rate necessarily a bad thing? Startup funding has increased by up to 100% in some regions in recent years, yet inflation has remained subdued. This means there's more cash available and higher burn rates can be tolerated, right? Yet, raising funds results in dilution, so in theory, one should only raise exactly what is necessary. Especially as any kind of macroeconomic crisis could result in funding disappearing overnight. For that, by budgeting and adhering to your forecast burn, you will ensure that an optimal amount of capital is raised and will maximize the likelihood of future funding being secured from existing investors. Brad Feld prescribes the "40% Rule" (albeit for SaaS businesses), where net burn (as a percentage of cash sales) + growth rate should both add up to 40%. This then acknowledges that higher burn rates can be tolerated if it's having a positive effect. Burn rate is one of the simplest, yet most fundamental metrics that investors and startup companies alike follow and communicate on. Many important conversations occur around what a typical startup burn rate should be, what affects it, and how it can be kept under control. Through this article, I will address these points, including wider, more wider issues, such as whether having a high burn rate is necessarily a bad thing. What Are the Types of Burn Rate? Net burn rate is calculated as the net cash spend per month; that is the net of cash inflows and cash outflows that occur when running your business. Generate $90,000 of sales (in cash terms) over the quarter. Your monthly net burn for the quarter will be $100,000 (=($1,000,000 - $700,000)/3) and your gross burn rate will be $130,000 (=($1,000,000+$90,000-$700,000)/3). In investor and startup communities, cash inflows are often referred to as “sales” and cash outflows as “expenses.” Strictly speaking, this terminology makes sense for companies that prepare accounts on a cash basis, which is common for young startups. But this method loses its relevance once companies scale up and prepare accounts on the more widely used accrual basis. In an accrual context, sales often differ significantly from cash sales, particularly for companies offering subscriptions. For example, if you sell your customers a 12-month membership to your platform for $1,200 paid in advance, granting them continuous access to its services for that period, your cash sales are $1,200 in the month of sale, but your sales on an accrual basis will be $100 each month. The same rationale applies for expenses that are deferred to future periods. To avoid confusion, we will be referring to cash sales and cash expenses in this article. Is there an easy way to reconcile between the cash and accrual bases? There is; the net burn rate can be reconciled to the cash flow statement presented in the financial statements. It corresponds to the sum of the operating, investing and financing cash flows. 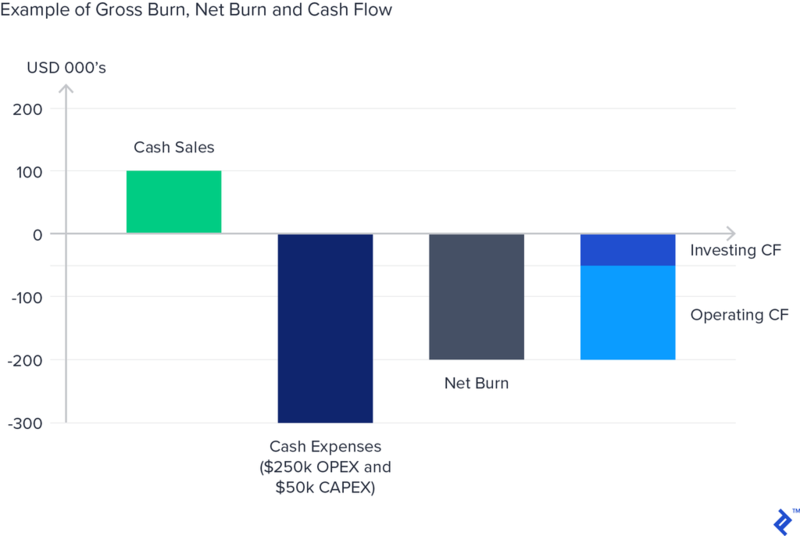 The relation between cash flows, net and gross burn can be visualized below. Practically speaking, what does the net burn rate actually mean? Well, it provides a rough estimate of how long a company is expected to survive. Using the previous example of a net burn rate of $100,000 and remaining cash balance of $700,000, the “life expectancy” of the company, known in the industry as “runway,” is seven months. Unsurprisingly, the parties primarily interested in matters pertaining to cash burn are the investors in the business; namely, the founders and external investors, as they are the ones that provide funding to the startup. Investors generally derive their expectation from the forecasted burn that was provided to them during the funding round. How Do You Set a Burn Rate? 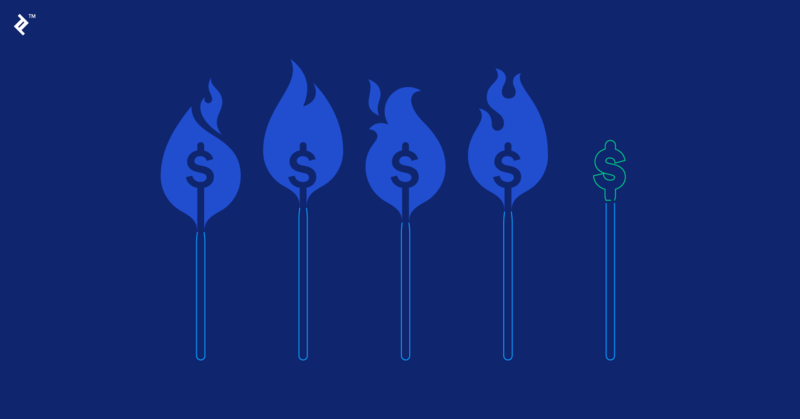 Setting a forecast cash burn rate should be done in two complementary ways. The first step is to derive it using an internal financial forecast model that includes cash sales, expenses, and capex. Drivers to the data in the model depend on the specific industry, but in the case of technology startups they are generally based on the number of users or licenses, price and incremental costs per user or license, and largely the cost of employees, contractors, and rent expenses. Building Product Stage: Up to $50,000 gross burn, where the team consists of three or four engineers, a product manager, and a designer. Building Usage Stage: Up to $100,000 gross burn, with the same team as in the building product stage plus a few more engineers, a community manager, and some additional expenses. Building the Business Stage: Up to $250,000, with again, the same team, plus an expanded management team, growth team, and some finance staff. These companies were at the building product or building usage stages and disclosed burn rates of up to $50,000, with a runway comprised of between 6 and 35 months (20 months on average). This compares to an average recommended runway of 15-18 months for early startups raising money, as per the experiences of investor Mark Suster. How Can I Control My Burn Rate? As we have discussed, founders and investors are equally interested in measuring the actual burn rate and comparing it to forecasted data provided at the prior investment round. This is because it gives an indication of the company’s life expectancy and its ability to control spending as it grows. It appears therefore essential that startups put appropriate tools in place to measure burn rate and keep it under control, to avoid a premature death of the company. 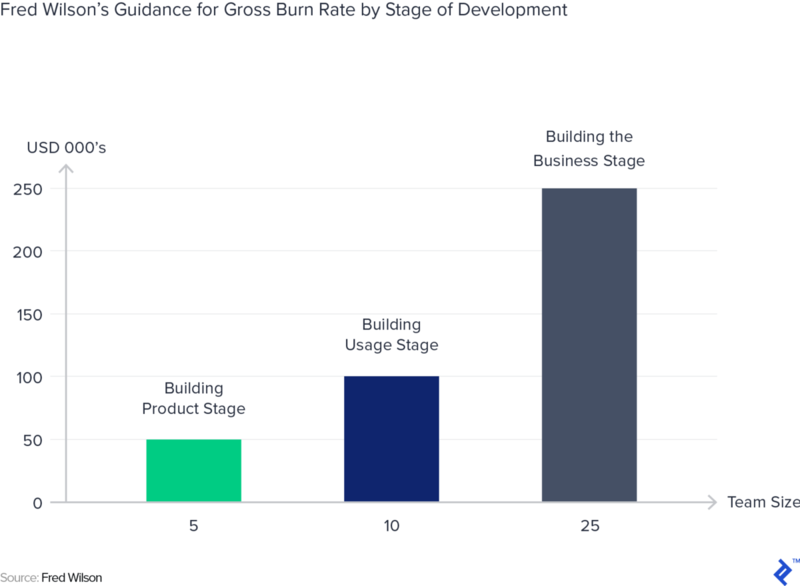 The first step to control your startup burn rate is to know at which stage of development you are in and then stick to elements essential to that stage before moving on to the next step. In other words, avoid putting the cart before the horse. It is easy to get lured into investing heavily in marketing, sales personnel, and expensive extra engineering, but this does not make sense until you know that you have validated that your product has indeed a client base on which it can grow. Knowing your customer well is a critical factor of success and it includes several dimensions including the market value, your likely market share, and the length of the sales cycle and of the intermediaries you use to market your product. For example, I provided consulting services to a company who was using intermediaries to gain access to clients. These intermediaries were large banks and consulting firms, whose acceptance processes were sophisticated and lasted typically over a year. Before scaling up the business, it was therefore critical for this company to maximize the advance cash received and minimize the burn rate until a number of partnership agreements with these intermediaries were achieved. Another mistake that companies make at an early stage is to bring in managers too early, or to have certain individuals, like the CEO, focus solely on one area like business development or fundraising, without much versatility elsewhere. At an early stage, cash is tight and individuals should have the capabilities and be ready to put several hats on: On a typical day, a CEO might therefore be having meetings with potential customers or potential investors, get involved in the design of the product, and end the day getting hands dirty with pure operational matters. Is There an “Accounting Way” to Control Burn Rate? The accruals accounting method offers options to account for some items, particularly certain types of expenses that might be deferred or recognized in one go, or startup costs that can be capitalized in the balance sheet, instead of being incurred in the profit and loss account. This does not apply to the cash basis, which is the entire basis of the burn rate anyway. At the end of the day, excluding financing, your burn rate is the difference between your ending cash balance and starting cash position. There is therefore little room to “manipulate” the burn rate, which is good news, as it helps bring confidence to the figures reported and allows comparability between companies, as we saw in the initial section. One aspect to consider under the cash basis, however, is the timing of “cash-ins” and “cash-outs” and whether reporting a monthly burn rate makes sense. For instance, a small company would typically make VAT payments, or prepay corporation tax on a quarterly basis. There will be significant distortion of the burn rate every month; therefore, it may be more appropriate to report the burn rate on a quarterly, half yearly, year-to-date or trailing 12-month basis. This could be augmented with a trend analysis in addition to, or as a replacement for, monthly burn. When looking to minimize burn, a company should be looking at each cash flow separately and at ways to reduce the cash outflows. Let’s take a look at each cash flow in turn. Should fewer engineers and salespeople be employed and be replaced by contractors? This may be more expensive in the short term, but it offers greater flexibility to increase or decrease the work force in case of exponential growth or sudden downtimes. Also, is it really that much more expensive when you add social security charges? These can be relatively low in countries like the US, but are well above 30% in countries like Spain and France. We had that exact discussion regarding sales people at one of the companies I worked for, as to which geographies should be covered and the type of contract that they should be hired on (employee vs. contractor). One key aspect that also helped us decide is that regulations compel you at times to adopt one model or the other, notably the question of tax presence and nexus; for instance, any person involved in the signing of a sales contract in India should be an employee, which limits flexibility. Young companies should avoid incurring unnecessary capital expenditures, if any at all. Items should be rented as much as possible, instead of being purchased; this includes, of course, facilities, but also basic office equipment. It is also crucial that companies enter into agreements that offer flexibility to scale up or down as required. Avoid for instance, minimum lease terms or specific conditions that are typically off balance sheet but would result in commitments in cash payments down the line. These are typically excluded from burn rate—most notably, the actual cash received from investors. There may be exceptions; for instance, some financial expenses may need to be included, such as interest on loans, as they impact use of cash and can be significant when financing has been sought through loan or bond channels. For example, at a company that I consulted for, the decision was made to secure advance funding from trade partners by providing them with a guarantee on a proportion of the funds. The issue here was as to the classification of interest expenses and other fees related to the guarantee: Although they were financing cash flows in nature, they were quite significant and directly impacted upon the available cash flow, thereby triggering our decision to report them within our burn. Loans and bonds, however, are not the way that funding is generally obtained by startups, as banks are usually too risk-averse to provide such funding to early-stage startups and, when they do, their their cost is prohibitive. Is a Higher Startup Burn Rate Acceptable? There is indeed a paradox: Why should one maintain a lower burn rate, or not aspire to increase it, within a macro context where liquidity is plentiful? Over the past five years, pre-money valuations have increased by between 50% and 100% in the US and by between 25% and 50% in Europe. This indicates that when companies raise funds, they are receiving more money than they did five years ago. With US inflation rarely rising above 2% over this time, it’s evident that startups generally have more cash resources at hand now. Yet, having a bullish market and potential access to more liquidity does not mean that startups should feel compelled to tap investors for as much as they can. Every fundraising results in dilution for founders and existing investors. The aim is, therefore, always for startups to reach a point where their operations finance activities with as few rounds as possible. But, with the creeping inevitability that a market downturn will arrive sooner rather than later prudence and pragmatism are required. In times of economic downturn, not only do stock exchanges collapse, but liquidity also dries out and companies are left to their own devices to survive. Having constant control over your burn rate and ensuring a long enough lifeline—of preferably 18 to 24 months—will ensure that your company is well-placed to face temporary economic stabilizations or react in a timely manner to economic downturn through staff reductions, among other emergency measures. Beyond limiting the number of investment rounds, another way to limit dilution for investors is to have them invest more money in the business when cash runs out. To reach that position, keeping your burn in line with your forecast will maximize your chances of obtaining additional cash from existing investors, as trust is reinforced with them. Let’s assume that two investors invested $5,000,000 each in your business. The first scenario is that you spent cash in line with your forecast burn and are asking for an additional 25% of the initial investment to grow the business: $2,500,000 in total. The second scenario is that you spent 30% over your forecast burn, without tangible results, such as proof that it helped underlying business growth. Now, you ask—three months ahead of the end of your runway—for 50% more funding: $5,000,000. It is clear that you are more likely to obtain funding from your investors in the first scenario, due to both the time negotiation dynamic and the trust built up through prior execution success. Now, it does not necessarily mean that a higher burn rate cannot be acceptable. Brad Feld coined the “40% Rule” for a healthy SaaS company, where “net profit” in cash terms (net burn rate as a % of cash sales) and growth rate should both add up to 40%. Following this rule, a 20% growth rate and positive 20% net burn rate would be acceptable, as would a 40% growth rate and 0% net burn or 100% growth rate and negative 60% burn rate. In other words, it is acceptable to go over your burn rate as long as it is justified by strong growth. Mere additional spend without supporting growth will raise eyebrows with investors. Although burn rate is an important metric which investors and founders watch closely, one should not get obsessed about it and should remain open toward opportunities that may arise along the way. For example, investing in a marginally more expensive engineer could be justified if they are a strong cultural fit who can truly scale the business and lead the technical team. As could the acquisition of a company that truly complements your business and/or enhances growth. One key rule is to keep investors in the loop to proactively maintain their confidence in your management ability, thus minimizing the risk of seeing dry taps further down the line when more cash is required unexpectedly. How do you calculate the burn rate? Net burn rate is the difference between cash inflows and outflows that occur per month for a business. Gross burn rate is simply the cash expense incurred on a monthly basis. What is a startup runway? Runway represents the survival time that a business has based on current cash reserves and its monthly burn rate (net cash outflows. The cash reserves divided by the burn rate will show amount of months left before funding is exhausted. A strategic finance professional, Pierre has established the reporting, forecasting, internal controls, and ERP of an internet startup growing 500%+. Previously, he led the financial due diligence for several acquisitions, including a $14 billion beverage company and created valuation models of firms in various industries. He leverages his extensive CFO and audit field experience in the US and Europe to advise clients on a wide range of topics.